We consider the problem of periodic exploration of all nodes in undirected graphs by using a finite state automaton called later a robot. The robot, using a constant number of states (memory bits), must be able to explore any unknown anonymous graph. The nodes in the graph are neither labelled nor colored. However, while visiting a node v the robot can distinguish between edges incident to it. The edges are ordered and labelled by consecutive integers 1,...,d(v) called port numbers, where d(v) is the degree of v. Periodic graph exploration requires that the automaton has to visit every node infinitely many times in a periodic manner. Note that the problem is unsolvable if the local port numbers are set arbitrarily, see . In this context, we are looking for the minimum function π(n), such that, there exists an efficient deterministic algorithm for setting the local port numbers allowing the robot to explore all graphs of size n along a traversal route with the period π(n). Dobrev et al. proved in  that for oblivious robots π(n) ≤ 10n. Recently Ilcinkas proposed another port labelling algorithm for robots equipped with two extra memory bits, see , where the exploration period π(n) ≤ 4n − 2. In the same paper, it is conjectured that the bound 4n − O(1) is tight even if the use of larger memory is allowed. In this paper, we disprove this conjecture presenting an efficient deterministic algorithm arranging the port numbers, such that, the robot equipped with a constant number of bits is able to complete the traversal period in π(n) ≤ 3.75n − 2 steps hence decreasing the existing upper bound. This reduces the gap with the lower bound of π(n) ≥ 2n − 2 holding for any robot. 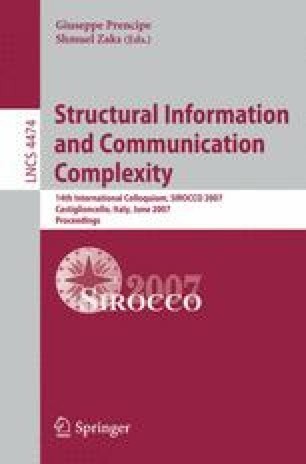 This research was partially funded by the project “ALPAGE” of the ANR “Masse de données: Modélisation, Simulation, Applications”, the project “CEPAGE” of INRIA, the European projects COST Action 293, “Graphs and Algorithms in Communication Networks” (GRAAL), COST Action 295, “Dynamic Communication Networks” (DYNAMO), the Nuffield Foundation grant NAL/32566, “The structure and efficient utilization of the Internet and other distributed systems”, and by a visiting fellowship from LaBRI/ENSEIRB.